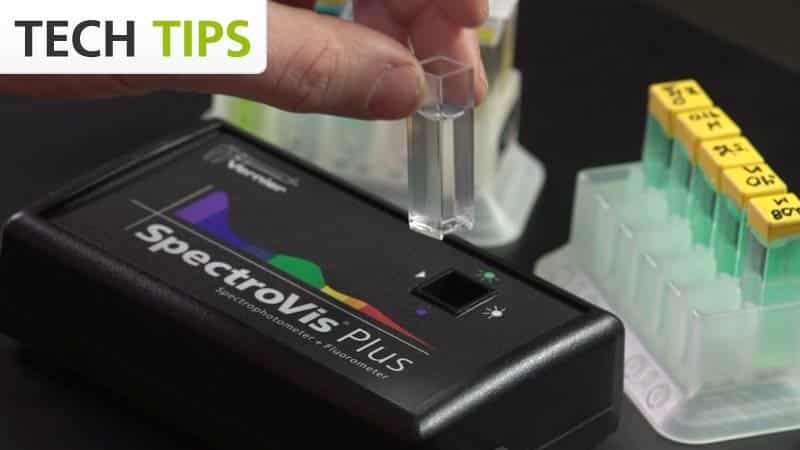 SpectroVis Plus is an affordable, portable, visible to near-IR spectrophotometer and fluorometer. SpectroVis Plus is a portable and affordable visible light spectrophotometer with fluorescence capabilities. 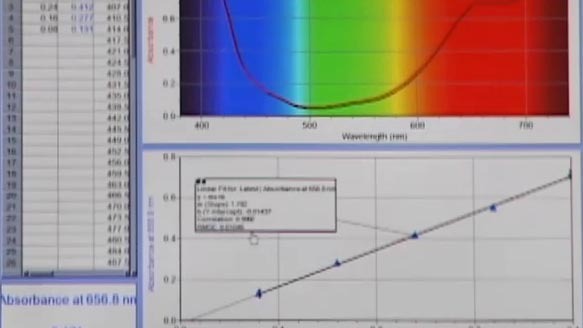 Measure wavelengths from 380 nm to 950 nm and analyze results in full color. The SpectroVis Plus educational spectrophotometer combines fluorescence capabilities with a linear CCD array detector in an award winning, compact unit that requires no external power supply. Two different excitation wavelengths enable analysis of compounds such as fluorescein, chlorophyll, or GFP. 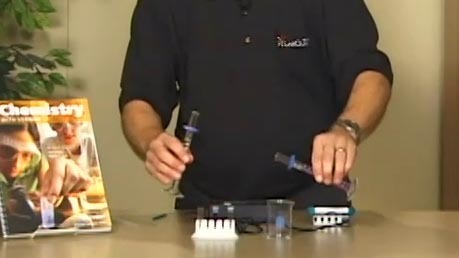 Connect SpectroVis directly to LabQuest or a computer USB port. Set up experiments quickly with one-step calibration. Collect data in under one second with array spectrometer technology. Analyze full-wavelength spectrum data in full-color with Logger Pro. SpectroVis Plus enables a wide range of introductory spectroscopy experiments for chemistry, biology, and physics. Determine peak wavelength to collect data on solution concentration for studies of Beer’s law or to monitor rates of reaction. Collect a full wavelength spectrum to measure absorbance, percent transmittance, fluorescence, or emissions. Engage in equilibrium studies of absorbance vs. time or absorbance vs.concentration. Perform colorimetric or fluorescent bioassays. Use the SpectroVis Optical Fiber Accessory to measure emissions from flame tests or other light sources. For more detailed emissions analysis, consider the Vernier Emissions Spectrometer. SpectroVis employs an LED and tungsten bulb to transmit light through a solution containing the sample. The transmitted light then passes through a high-quality diffraction grating and the diffracted light is sorted and collected by the linear CCD array detector. Determine the concentration of an unknown solution using a Vernier SpectroVis Spectrophotometer. Use a Vernier SpectroVis Spectrophotometer to determine the concentration of an unknown solution. An investigation of the rate law determination of the crystal violet reaction using the LabQuest and SpectroVis. Light Sources: Incandescent white bulb, approximately 8000 hour lifetime, one-step calibration. LED-based, approximately 100,000 hour lifetime. No external power is required. Download free spectroscopy experiments for your spectrometer! The labs include ready-to-use student instructions and you can adapt them to your curriculum. The SpectroVis Plus may require a compatible interface and software. Choose a platform below to see compatible interface and software options. 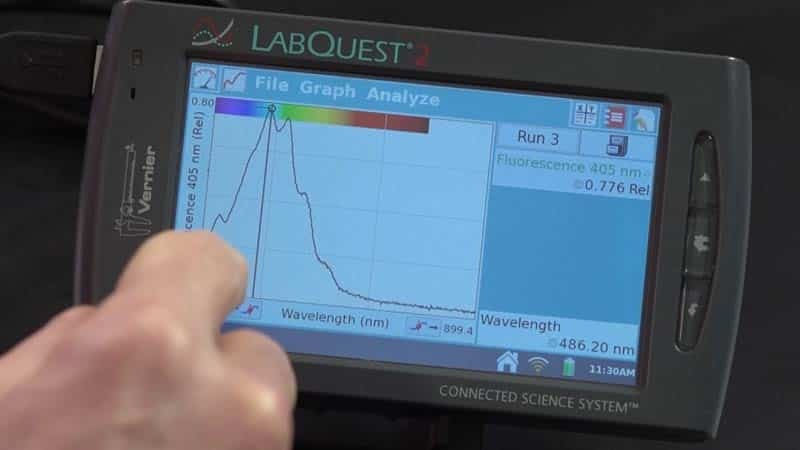 The SpectroVis Plus is fully supported with LabQuest 2 (version 2.8.5), a standalone data logger with built-in graphing and analysis software. Connect this sensor directly to a computer or Chromebook via a USB connection and use with Spectral Analysis App for best results. Alternatively, this sensor is fully supported when used with LabQuest 2 when LabQuest 2 is connected to a computer or Chromebook via Wireless Data Sharing.